The Holy Eucharist rested in our Sanctuary as the namesake of The Church of the Blessed Sacrament beginning with our dedication in 1962. Later, we constructed a Day Chapel to provide a beautiful setting and intimate environment to experience Jesus. Over the years, much discussion and many requests have focused on bringing the Eucharist back into our Sanctuary. Hearing those requests, focusing those discussions, and analyzing our recent survey results regarding engagement led us to realize a clear vision that our Parish desires to better hear, see, and feelChrist by bringing the Blessed Sacrament back into our Sanctuary. Over the past six months, many groups, including the Pastoral Council, Finance Council, Facilities Committee, Diocesan Architects and a Project Steering Committee have worked together diligently on this project. The objective of bringing the Blessed Sacrament back into the Sanctuary has provided the opportunity for an overall Sanctuary Enhancement. Replacement and improvement to the sound system. Additions of cameras and video screens. Necessary construction to the Reredos backdrop for the Tabernacle and Crucifix. Magnificent artwork and painting by nationally recognized restorer Conrad Schmitt. Read the full project specifications below. The desire to bring Jesus back to the Sanctuary triggered modifications, additions and improvements that will drive engagement and create an environment to better hear, see, and feel Christ. The total project cost is $250,000, and with approximately 1,000 parish families, it would only cost each family $250 if we could obtain 100 percent participation. We all benefit from this Sanctuary Enhancement, so it makes sense that we all participate. With that said, we realize that each family cannot absorb $250, while many others can contribute much, much more. As you consider your contribution to the Sanctuary Enhancement, we ask you to reflect on the sacrifices made by past generations at Church of the Blessed Sacrament and prayerfully consider the benefits of your generation and your commitment to others. Help us restore the past and invest in the future. No gift is too small or too large in supporting Church of the Blessed Sacrament through our Sanctuary Enhancement project to better hear, see, and feel Christ. 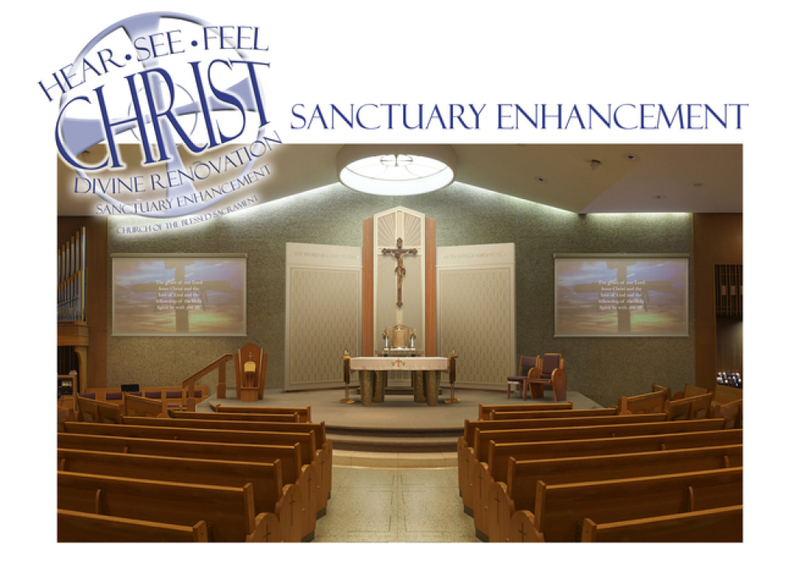 Our timeline is for all monies to be received by May 15, 2016, so please make your donation to Church of the Blessed Sacrament and include “Sanctuary Enhancement” on the memo line. Place it in the collection basket, at the table in the gathering space, in the office or make a one-time donation through FaithDirect. What Did the Project Include? Sound System: One low profile ambo microphone, three clip-on wireless microphones and body packs, one ear-worn wireless microphone and body pack, two handheld wireless microphones, two microphone antenna systems, one digital mixer/processor, one mixer control, five amplifiers, one solid state recorder, one music input in rack, ten compact full-range speakers for seating area, two compact speakers for sanctuary area, two low-profile ceiling speakers in cry room, four low-profile ceiling speakers in narthex, four volume controls, one eight-channel mixer in choir area, one music input in rack in choir area, one six-channel sub snake in choir area, one antenna kit in choir area, one equipment rack, three power sequencers, one remote on/off switch, one security cover kit, speaker cabling, hardware, training, documentation, design, modeling, etc. Video Projection System: Two 7,000-lumen projectors and mounts, two projection screens and controls, two 5,000-lumen projectors and mounts, one input panel, one Apple TV, one Blu-Ray and DVD player, two switcher-scalers, one distribution amplifier, one 4-channel mixer, one small monitor, four IR (infrared) repeaters, seven data conversion packages, one control desk, electrical supplies, one power sequencer, one security cover kit, video cabling, hardware, training, documentation, design, etc.